Running out of space on your hard drive? Seagate and TDK are hearing your pain and have recently unveiled a new groundbreaking technology that is set to allow the next generation of hard drives to reach capacities of between 20TB-40TB by 2020. In recent years the traditional (mechanical HHDs) hard drive industry was somewhat overshadowed by the Solid State Drive (SSD) industry which has been gaining more and more percentage of the market. SSDs are significantly faster and lack mechanical parts and so are assumed to be more durable than traditional hard drives. SSDs, however are also more expensive per megabyte and are not economical for storing Terabytes of data. For that reason, HHDs are not going anywhere – they are a proven mature technology with very high capacities (currently around 4TB). However current HDD technology is about to reach its limits very soon. Currently HHDs have a maximum density of around 750Gbits per square inch. A hard drive store information in tiny cells which change their polarity in order to accommodate zeros and ones. If the cells are too small they can become unstable and change polarity on their own – thus not allowing the hard drive to function properly and store information. 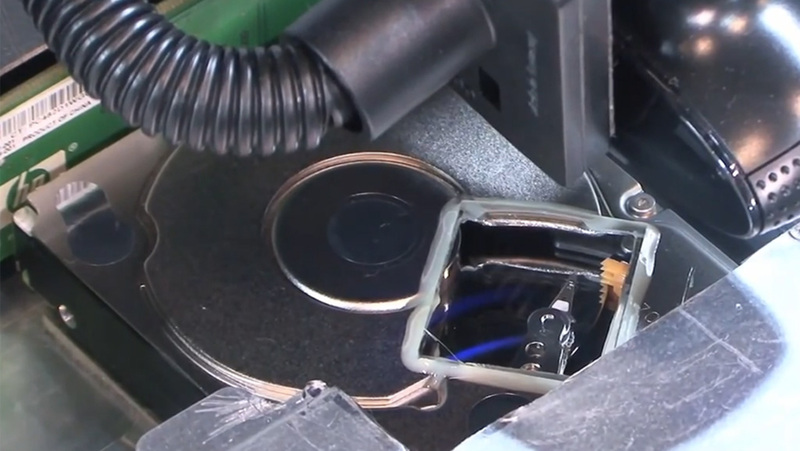 To overcome this problem hard drive manufacturers have been working for almost 10 years on the next generation of hard drive technology called Heat-Assisted Magnetic Recording (or HAMR for short). This new technology introduces a tiny laser into the head of the hard drive for the first time. The aim of the laser is to allow the drive to write bits of data closer together without the risk of accidental polarity change by warming up a very precise spot on the hard drive platter where the specific cell is. Making this technology to work properly is a huge challenge. However during a recent CEATEC 2013 which took place in Japan last month TDK together with Seagate demonstrated a working HAMR hard drive. This prototype had a groundbreaking tiny laser unit built into the HHD head which can achieve a super tiny light spot of only a few tens of nanometers wide – allowing for a very precise and localized heating of the hard drive surface. So far TDK was only testing the technology in the lab using very complex dedicated equipment, however now with the help of Seagate they were able to create a running functional prototype hard drive which has been show during a live demonstration to operate Windows 7. TDK is optimistic that it will be able to bring the technology to the market at around 2015-2016 – others in the industry are more skeptical stating 2017 as a more likely date for the first HAMR drives to reach the market.